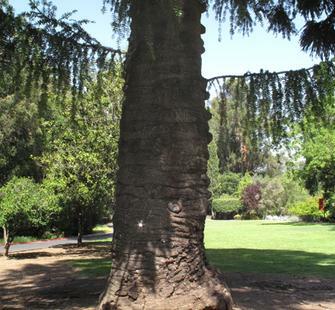 Montalvo is home to many wonderful and unusual specimens of trees planted throughout its grounds. For example, the​ century-old​ towering Bunya-Bunya pine (Araucaria bidwillii), planted on the Great Lawn, is sacred to the Aboriginal people of Australia and is unique in Northern California. 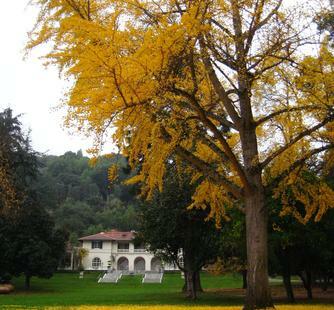 In the past few years, plantings of beautiful and rare trees have once again begun at Montalvo to increase diversity and ensure at least another 100 years of arboreal interest on the grounds. Among these are the Kashmir Cypress (Cupressus darjeelingensis) from the eastern Himalayas; ​the Monterrey Oak (Quercus polymorpha) planted to honor the career and generosity of noted arborist and great Montalvo friend, Barrie Coate; and a Wollemi Pine (Wollemia nobilis), which is one of the rarest trees in the world—only around 100 adult specimens are known to exist.